Tsinghua University in China and Visionox, a display manufacturer, have teamed up to open China's first OLED production line. Building the line began in 2005, when the future for OLED technology looked less uncertain, especially with some Asian companies involved in its development folding. 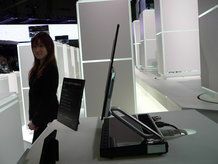 But thanks to a recent upturn in interest for the technology, the new line will help boost the country's display output. Although the line will only be focusing on smaller screens, for devices like mobile phones and GPS systems, it signals another move for the country into next-gen technology, after the RMB 500 million (£46m) investment in the line. This is the first of multiple lines from Visionox, which was partly set up by Tsinghua University. The next OLED line will be coming in 2009, when other companies should have entered OLED production on the region. Universal Display Technology also bought OLED production equipment last year, and will also begin producing screens likely next year.